On your request we will send you the new catalogue number 11 free of charge. It is packed full of products and accessories for all your microscopy requirements. Simply divided in 45 chapters easy to find your way to the products of interest. 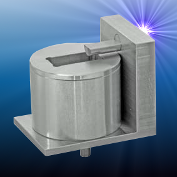 The specimen holder for scanning electron microscopy described herein allows a single specimen to be examined in any possible view and significantly improves object illumination. The specimen is glued to a fine pin and flexibly mounted on a double-sided adhesive conductive pad on a rotatable pivot. A milled pot placed beneath the specimen acts as an electron trap. This provides a homogeneous black image background by minimizing noisy signals from the specimen’s surroundings. 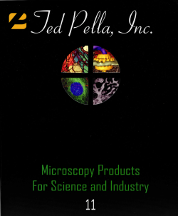 Because the electron microscopy world of today is rapidly changing into a multi-microscopy and technology discipline we felt the need to extend our program with the products from Ted Pella to meet the changing laboratory, research , investigation and development requirements. Below you can download the catalogue sections of your interest, for price information please send us an email or use the contact form.